Polybags' range of standard biodegradable packaging is made from regular polythene - i.e. manufactured using oil-based polymers - with an additive that acts as a catalyst to accelerate the degradation process. The additive - named TDPA (Totally Degradable Plastic Additives) and produced by EPI Environmental Technologies - is designed to manage the lifetime of polythene products so that, once their useful shelf life has passed, they will first degrade and then biodegrade into environmentally-benign products in a matter of months or years, rather than decades or centuries. 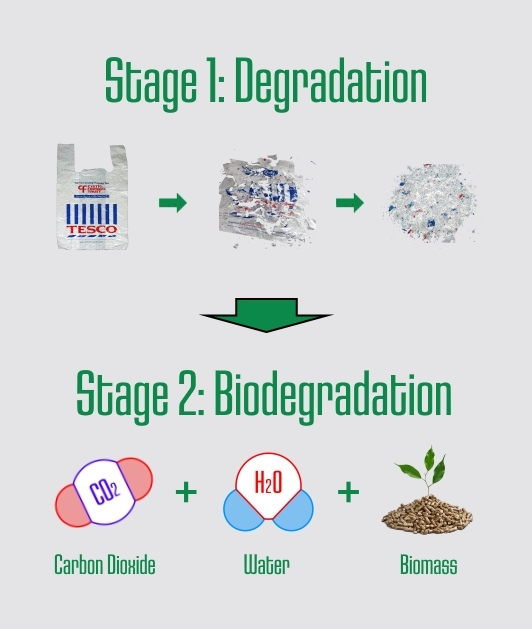 When oxo-biodegradable packaging is exposed to either sunlight, heat or mechanical stress - or a combination of these - a two-step degradation process is triggered. First, the polythene breaks down through oxidation into smaller and smaller fragments (stage one), which then biodegrade into the natural elements of carbon dioxide, water, biomass, and minerals (stage two). Regular polythene will degrade over time, although this process can take decades or even hundreds of years in a landfill site. The TDPA additive used in our biodegradable packaging ensures that this process is accelerated by a factor of hundreds or even thousands. This means that the packaging will degrade and physically disintegrate in anything from a few weeks to 24 months depending on the physical conditions in the disposal environment (presence of oxygen, moisture, heat, mechanical stress and/or microbes). A UK study found that oxo-biodegradable polythene films with the TDPA additive were mechanically and chemically broken down in an operating landfill, degrading over a period of 11 months from a molecular weight of 115,000 Daltons (the unit of atomic mass) to 4,250 Daltons - i.e. less than 4% of its starting weight and to a value (<5,000 Daltons) considered to reach total degradation as per International Standard ASTM6954 (Guide for Oxo-Biodegradable Plastics). Our biodegradable packaging has a shelf-life of one year from the date of manufacture, although the same additives that accelerate the degradation process also reduce this shelf life, so it is not advisable to keep the biodegradable packaging in a warm place or in direct sunlight. The packaging can be placed in compost, although it would decompose very slowly. This timescale for biodegradation does not meet the requirements for European compostable packaging standard EN13432, although independent studies have demonstrated that plastics with the TDPA additive compost well and produce good quality compost with no toxic effects. For further details on EU standard EN13432 and packaging that meets all of its requirements, see our compostable packaging page. For more information on how our biodegradable bags work, please visit the website of EPI Environmental Technologies at epi-global.com.